Yes, yes, I know the rhyme’s pretty screwed up for this particular bento but my brain is fried right now so that’ll have to work as an intro. 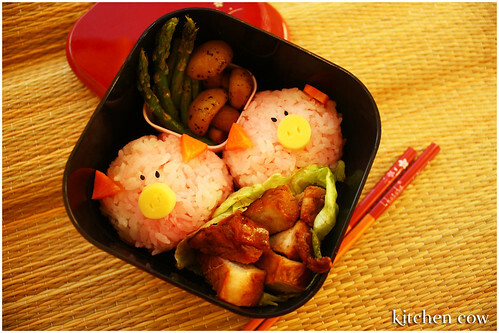 This lunch is a quick attempt at cutesy bento, and I think it works. I find it really cute, at the very least. This meal has two pig onigiri, made from rice mixed with sakura denbu (hence the pink color) and garnished with cheese snouts, carrot ears and black sesame seed eyes. As sides, I sautéed some asparagus spears and mushrooms in butter then dusted liberally with freshly cracked black pepper. Lastly, I also prepared some shogayaki, a Japanese pork dish that incorporates lots of ginger for a very tender, flavorful pork cutlet. It’s traditionally served with some lettuce leaves and tomato wedges but I had to skip the tomato part since we were out. 1. Mix together ginger, soy sauce and sake. 2. Marinade pork for 5 minutes. 3. Heat some oil then add the pork cutlets. 4. Pour leftover marinade, turning cutlet to cook each side evenly. …yes. Laugh all you want but I was able to grab a couple of recipes off Cooking Mama. Hehehe, OK ah! Recipes off Cooking Mama. Parang gusto ko na rin maglaro nun. Laro na! It’s so much fun. I think your piggies are super cute. And I bet they are tasty too! this was cute and creative! Thanks BarbaraB & Mimi! Happy New Year to you guys! I dont eat pork, will the shogayaki work if i substitute fish (like tanigue) instead? This looks very good and tasteful…and i like the presentations here, not only the bento, although this is my favorite of all. I’m not sure but I don’t see why not. It probably won’t have the same effect, texture and taste-wise but I don’t see how marinating fish in soy sauce, sake and ginger can go wrong. Please, let me know how it turns out if you try it?